The Summer had been frustrating for Peter Reid, he was only too aware of the limitations of his squad. His attempts to strengthen it in order to compete with the big clubs floundered on Chairman Peter Swales’s refusal to provide the money necessary. And was causing an obvious rift between the two characters. Pre-season started in Ireland with a 5-1 against Ards and a 4-1 win against Dundalk. The opening game of the season saw a 1-1 home draw against Leeds, however City were soon up against it losing 1-0 at Everton. With the pressure on Peter Swales he decided to appoint former journalist John Maddock as General Manager so that he could step away from the day to day involvement on the playing side, which he said “May have impaired progress”. Things didn’t get any better and chants of Swales Out were heard as City lost 1-0 at Tottenham and then 2-0 at home to Blackburn where there was a demonstration against the board outside the ground. Maddocks ominiously commented “What happened tonight is not good enough. I am talking about the performance and about the lack of spirit”. The fans didn’t get their way, instead of Swales leaving it was surprisingly Peter Reid and Sam Ellis who were sacked two days later, just four games into the season and after finishing fifth, fifth and ninth in the previous seasons with a limited team over the three seasons, everyone apart from ‘team Swales’ could see Reid had been hard done by. Peter Swales issued a statement saying neither he, fellow shareholder Stephen Boler or brewer’s Greenalls would be selling any of their shares, which make up 80% of the club holding. Just days later however Boler said he would consider selling his shares to Lee on agreement from Swales, and would meet to discuss this with Lee after the next game, which ended in another good win 3-0 against QPR at Maine Road, where the City fans were putting all their vocal support in favour of the ‘Forward With Franny’ campaign. It seemed that Swales was realising that the club he had presided over for 20 years, would now end up in new hands, however he seemed determined that it would not be those of Francis Lee as he announced he was in advanced negotiations with another buyer. City then flew out to Turkey for a midweek friendly against Fenerbahce, where they lost 3-1. Away from the politics, Brian Horton brought in his first signing, paying Middlesbrough £1.5M for defender Alan Kernaghan, the Irish International made his debut at Wimbledon but couldn’t help City avoid a 1-0 defeat. Away from the League The Blues drew 1-1 at home to Reading in the 1st leg of their Coca Cola Cup 2nd round tie. And then, despite an ever increasing injury list, it was another victory in the league under the new Horton regime as City beat Sheffield United 1-0 at Bramhall Lane. The familiar chants of Swales out returned to Maine Road however, as a lacklustre performance against Oldham ended in a 1-1 draw. A late Niall Quinn goal quelled further unrest as City won 2-1 at Reading to progress to the 3rd Round of the Coca Cola Cup. And then a resolute 0-0 draw against Arsenal at Highbury, and a 1-1 draw against Liverpool at Maine Road meant that the unfancied Horton had still only lost one game since he took over, and had certainly diluted the ‘Swales Out’ Chants. In the Coca Cola Cup 3rd Round City won again, beating Glen Hoddle’s Chelsea 2-1 at Maine Road. Striker Carl Griffiths then joined the club for £450,000 from Shrewsbury Town. Francis Lee’s consortium made it’s first official bid to takeover the club by offering to buy a 29.9% share in the club, however the board backed Peter Swales and rejected the bid out of hand. the boardroom problems may have started to affect the players and The Blues slipped to two defeats, 3-1 at West Ham and then 3-2 against Manchester United at Maine Road. Back to the football and City drew 0-0 at Nottingham Forest in the 4th Round of the Coca Cola Cup. In the league they lose again 3-2 at Leeds. But then manage a 1-0 win at home to Everton, however it became just one win in the last eleven games as City lost 2-0 at home to Tottenham, and then they lost at home again losing 2-1 against Nottingham Forest in the replay of the 4th Round of the Coca Cola Cup. City couldn’t buy a win and lost again 2-0 at Blackburn. This was followed buy a swop in the transfer market as David White moved from City to Leeds and David Rocastle moved in the opposite direction. The Christmas period saw just one game on the 28th December as City’s other game against Aston Villa was postponed due to the weather. The Blues drew the game at home to Southampton 1-1. On New Years Eve City agreed a loan deal with Birmingham to bring Carl Shutt to Maine Road. 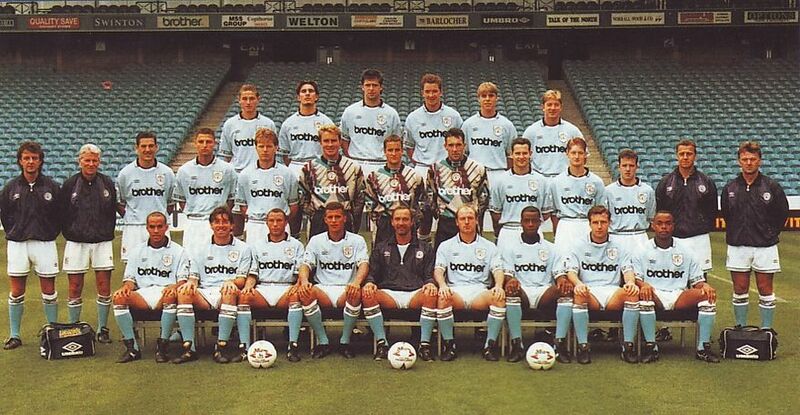 New Years Day 1994 brought further misery for City as they lost 2-0 at Newcastle. City were totally devoid of luck as in their next game at Maine Road whilst leading 2-0 against Ipswich the game was abandoned due to a waterlogged pitch. Away from the league City beat Leicester 4-1 in the 3rd Round of the FA Cup at Maine Road, and then with rumours flooding around Maine Road that Franny Lee was soon to be ensconsed as City’s new owner the Blues drew 0-0 against Arsenal, and then lost at Liverpool 2-1. The solace of the FA Cup was no more for Brian Horton’s side as they were knocked out, losing 1-0 to Cardiff at Ninian Park, and so with just a relegation battle ahead of them City cofirmed that Francis Lee’s consortium’s bid had finally been accepted by the board. Part of the agreement was to buy 29.9% of the Swales/Boler shares and make £5M available immediately for improving the team. Lee, Colin Barlow, another former City player, and Manchester businessman, John Dunkerley, were co-opted onto the board with Peter Swales resigning. Beleagured Brian Horton commented “The new chairman could give everyone a lift, The uncertainty has played a part in our performances.” Franny was given a tumultuous welcome at the next game at Maine Road and the team rose to the occasion to beat Ipswich 2-1. Another home game saw a 0-0 draw against West Ham but then City lost 4-0 at Coventry leaving them stranded in the bottom three with a third of the season to go. Although failing to score in the third game on the trot the Blues crawled out of the bottom three on goal difference as they drew 0-0 at Aston Villa. And then improved their position further with a 2-1 win at home to Swindon, and a 1-1 draw at QPR where German striker Uwe Rosler, on loan from FC Nurembeg, made his debut. Prior to the game Carl Shutt finished his loan move and returned to Birmingham. Brian Horton’s search for another striker to help City’s fight against relegation ended when he signed Paul Walsh for £750,000 from Portsmouth, also brought in on loan was Steffan Karl from Borussia Dortmund. Despite the new player intake City lost at home 1-0 against Wimbledon, and then fail to score again their next two games both ending 0-0, at home to Sheffield United and away at Oldham where City unveiled another new signing, Peter Beagrie, purchased from Everton for £1.1M. Horton’s tenure at Maine Road was under threat as City drew again, 2-2 at Ipswich, however the new players finally started to gel and beat Aston Villa 3-0 in front of a very relieved Maine Road crowd. A late Steffan Karl goal gave City all the points at Southampton with a 1-0 win, and back at Maine Road the Citizens made it three wins on the trot beating Newcastle 2-1, and with just four games left it looked like the Blues would avoid the drop. A seventh game unbeaten saw a 1-1 draw at home to Norwich, however title chasing Manchester United tried their best to plunge City back into the relegation fight beating the Blues 2-0 at Old Trafford. 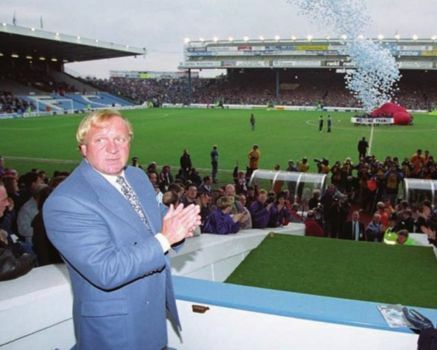 The last home game of the season saw a 2-2 draw with Chelsea and also the last sight of the Kippax before it was torn down to make way for an all seater stand which would be ready part way through next season. A 1-1 draw at Sheffield Wednesday meant that The Blues finished in 16th position in the league. Tony Coton was voted Player of the year and Rae Ingram Young Player of The Year.